WhatsApp Grants '7 Minutes' To Correct Your Past Mistakes! WhatsApp Grants ‘7 Minutes’ To Correct Your Past Mistakes! The much awaited news from WhatsApp is finally here! ‘Delete for Everyone’ feature has been rolled out by the leading messaging app. The team had been working on this feature for over a year and has finally enabled it for all users across iOS, Android, Windows platforms. However, it is being launched in phases and should be available for all users in the next few days. The feature will be a great help to those who send message to the wrong recipient. What Is ‘Delete For Everyone’? Many a times, we come across a situation where a message has been sent to an unintended recipient or we wish we could take back a message we wrote in haste. This new feature will help bail out in such tricky circumstances. This feature will allow a sender to tap on an erroneous message and select ‘delete for everyone’, which will erase the message on the receiver’s device. However, there are some terms and conditions to use this feature, like, a message can only be deleted within seven minutes after being sent. Another condition is that recipients should have the latest version of WhatsApp for the feature to function. How Does The ‘Delete For Everyone’ Feature Works? So far there has been no official word from WhatsApp how this feature works. However, a research on Internet reflected that this feature works like Gmail’s Undo feature. Seemingly, when the feature is enabled, WhatsApp sends a copy of message to the recipient. When the receiver gets the wrong copy, WhatsApp will not show any notification and won’t save it in chat history. However, it will match the message ID in database, if the message is found in database, it will be revoked. However, there is a time frame of seven minutes before you can revoke it. If the message is not revoked within seven minutes of sent, it will not recall. 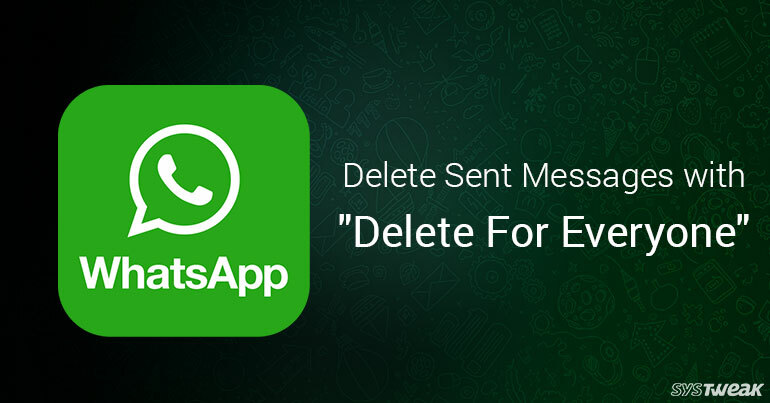 The ‘Delete for Everyone’ feature works for any message type in WhatsApp like text messages, images, videos, GIFs, voice messages, contact cards, files, locations, quoted messages and status replies. Go to the chat, which contains the message you wish to delete. Tap and hold the message. You also have the option to delete multiple messages at once. Here, tap on Delete. Now, tap on Delete icon located bottom left of the screen. You can select Delete for everyone or Delete for me. We hope this feature will help you wipe out messages sent by mistake before your recipient gets a chance to read it. Please feel free to share your comments below.